Autonomous Active Learning of Task-Relevant Features for Mobile Manipulation - Download this document for free, or read online. Document in PDF available to download. 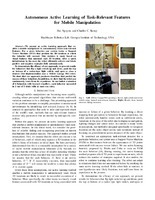 We present an active learning approach that enables a mobile manipulator to autonomously learn task-relevant features. For a given behavior, our system trains a Support Vector Machine SVM that predicts the 3D locations at which the behavior will succeed. This decision is made based on visual features that surround each 3D location. After a quick initialization by the user, the robot efficiently collects and labels positive and negative examples fully autonomously. To demonstrate the efficacy of our approach, we present results for behaviors that flip a light switch up and down, push the top or bottom of a rocker-type light switch, and open or close a drawer. Our implementation uses a Willow Garage PR2 robot. We show that our approach produces classifiers that predict the success of these behaviors. In addition, we show that the robot can continuously learn from its experience. In our initial evaluation of 6 behaviors with learned classifiers, each behavior succeeded in 5 out of 5 trials with at most one retry.